One of the common problems with our aging cars and especially if you have installed a short-shift kit is a difficulty getting into second gear -- commonly it only happens when your are making a fast, left-hand turn but that's not always the case. By adjusting the way the shifter travels to get into gear this problem can be alleviated, if not cured. As always, you should have a Bentlet shop manual with you as a guide. 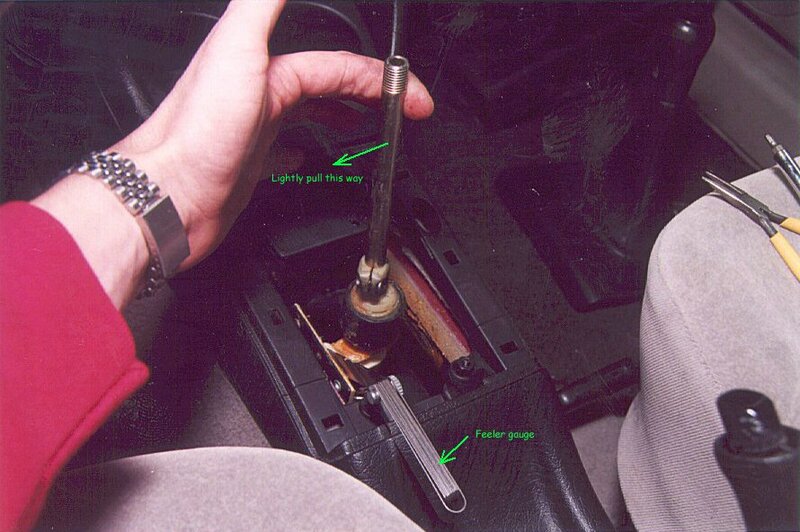 See page 34a-8, step 8, for adjusting the shifter. Note that the Bentley printed the wrong Figure number; look at Fig. 9 for adjusting the gap, not Fig. 10 as published. 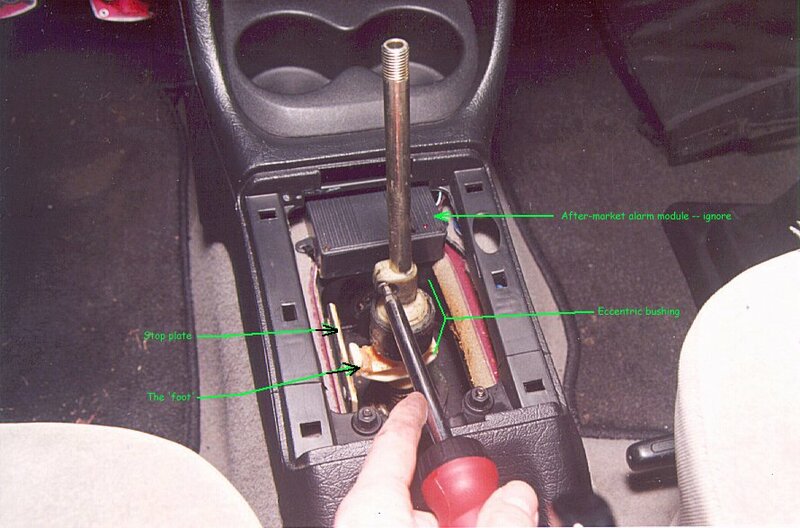 Remove the shift knob from the shift shaft by rotating it counter-clockwise. 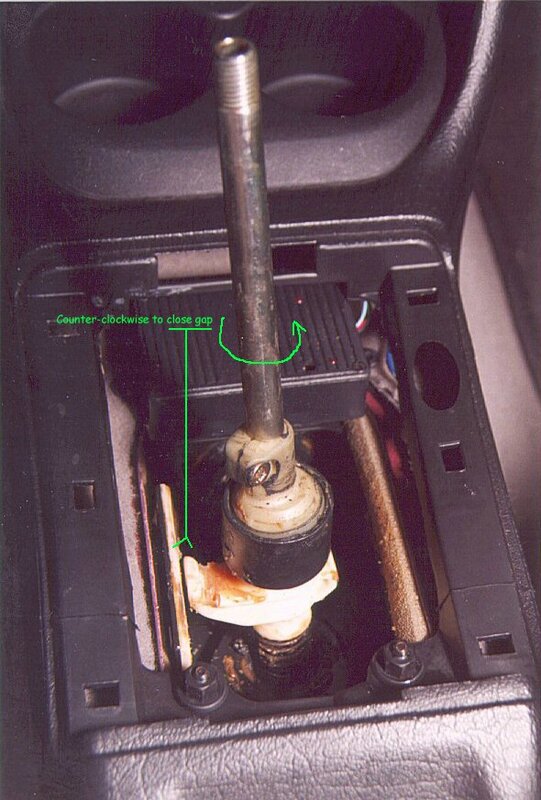 The plastic shifter surround that the shift boot is attached to comes off by carefully prying it off. A large, flat-bladed screwdriver helps. Now loosen the eccentric bushing locking screw using a #4 Allen head (see photo). Make sure you really have this loose and not just slacked off by a couple of turns. Put the shifter into first gear. Take the 'slack' out of the shifter by pulling it left to the point where you start to feel greater resistance. This is a tough call and relys on your sense of feel and gut mechanical aptitude. If you're not sure then it may be best to have someone more experienced do this for you. Anyway, put the feeler gauge between the left plastic stop plate and the plastic foot that comes off the shifter. Now, rotate the eccentric bushing COUNTER-CLOCKWISE to close the gap. You can use the locking screw tab to make the adjustment. Because the plastic is slick and there's grease all around feeling the proper adjustment may be difficult -- you may want to eyeball it (adjust gap more by sight than feel) and I recommend wiping all the grease off before you measure. If you're not sure, adjust it to where you feel it should be, then rotate the eccentric bushing CLOCKWISE a couple millimeters (this will widen the gap) as it's better to be safe than sorry. You can always adjust the eccentric bushing again if it needs it. Here's how mine turned out (shifter is in first gear). Notice how little the eccentric bushing was turned (<45-degrees) compared to the first photo (stock position). It really doesn't take much to make a difference so take it easy! When done, tighten the eccentric bushing locking screw and apply some more grease to the stop plate and foot. Wipe your hands then snap the shifter surround back on and screw the shift knob back on. Done!